Cataract Awareness Month is a great time to learn more about cataracts and to remind yourself and loved ones to make an appointment with an eye doctor for a thorough examination. Lights seem too dim for reading or close-up work or you are overcome by strong light. You may sometimes notice the cataract in your eye as it may look like a milky or yellowish spot in the pupil of the eye. You change eyeglass prescriptions frequently and the change does not seem to improve your vision. You experience blurred vision, double vision, ghost images or the sense of a film over your eye. Although getting a cataract is very common, it does not have to result in permanent vision loss if you protect your vision and make a commitment to take care of your eyes by getting a dilated eye examination. 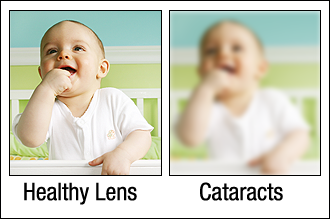 Not only will you be protecting your sight from cataracts, but other eye diseases as well.